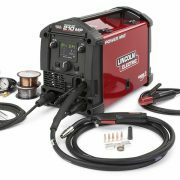 The Forney 230 Volt MIG Welder, Model 311 is a workhorse machine that can weld up to 3/8” mild steel plate. When it comes to portable welders, the Forney 311 is a brute. It’s one tough customer! 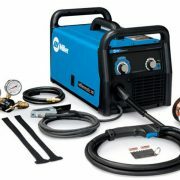 The machine can handle both conventional MIG welding and Flux-Core welding processes, although a Spool Gun must be purchased separately for welding aluminum. The heavy duty, quick-change torch makes it easy to back and forth between the conventional MIG gun and the Spool Gun. 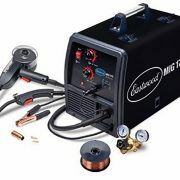 The all-inclusive package of the Forney 230 Volt MIG Welder has just about everything you need to get started. It includes a 16-foot power cord, an extra-long 10-foot MIG gun torch for easy access to the work, a Flowmeter & gas hose. The machine utilizes standard consumables that are compatible with Tweco parts, so there is no fear of finding replacement parts down the road. It’s a solid machine, yet compact enough to fit into the portable MIG category. 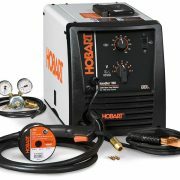 It’s a great machine for both beginner welders and experienced tradesmen alike, regardless of your skill level. You can quickly dial in the machine by flipping up the cover and referring to the handy chart inside. Simply find your process and thickness, set the dials, and you can be laying down a perfect bead of weld in no-time. If there is a negative side to the Forney 230 Volt MIG Welder it’s the weight. While it meets the criteria to be a portable MIG welder, it’s a little on the heavy side. Weighing in at 78 LBs it’s a little hefty to lug around the job site. But if you need the extra power, it’s worth its weight in gold. Just let the big guy in the crew carry it! Another minor issue is that the package doesn’t include a spool gun. However, if you think you will be welding aluminum and need a spool gun, you can purchase one separately. The Forney 230 Volt MIG Welder is the obvious choice for someone who needs a portable welder that can perform well on heavy plate. Not only can the machine weld 3/8” thick plate, but it also has a 100% duty cycle when welding at 85 AMPs. This is a rare find in all of the portable welders that I have researched. Forney also has a pretty decent 5/3/1 warranty against manufacturers defects, so you can sleep well at night, knowing that your investment is protected. Since they have been around since 1932, it’s not likely that they are going away anytime soon. Another point is that you can’t build junk and stay in business very long.